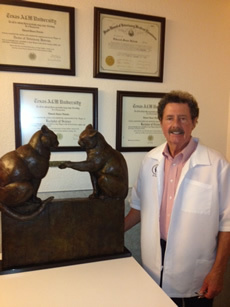 Dr. Ed Nichols displays Dan Ostermiller bronze, "Barnyard Gossips"
Welcome to Crestway Animal Clinic! Dr. Edward J. Nichols DVM began practice at Crestway Animal Clinic in San Antonio, Texas in 1980 and in 1994 became owner of Crestway Animal Clinic. Our facility is a clean and safe environment for your pets and they will feel relaxed and comforted by our personalized care. Our staff loves animals and treats each patient as if he or she were their own. Crestway Animal Clinic provides services in the following areas: General Medicine, General Surgery, Dentistry, Allergy Testing, Microchipping, Nutritional Counseling, Behavioral Counseling and Medicinal Bathing.